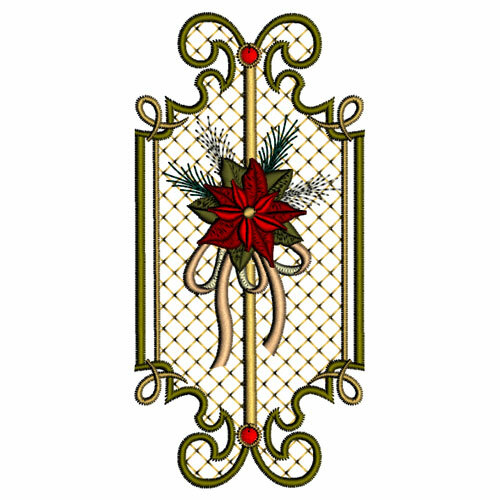 I have enjoyed preparing this collection which consists of elaborate detailed Christmas designs. The final set for 12″ by 8″ hoops is being released today, January 13th, 2015. There are 10 big designs in this set and I think you will find lots of uses for them. There are several designs in this set that are perfect for cushions. The design below has candy sticks and my elaborate bow in it. It did take quite a while to get all the elements, especially the Candy sticks, in the right place. Perhaps you could eliminate the bow and attach a real one instead! I love the jeweled effect of the scroll corners in this collection so I am sure that a few extra crystals would enhance these designs even more. Don’t necessarily go for silver crystals but be a little more subtle as there are so many shades out there to choose from. Replace the centre of the poinsettias with a trio of gold and green crystals to bring them alive. I used 10ss citrine, crystal copper and tangerine in the photo above. If you have looked up close at a poinsettia (Euphorbia pulcherrima) you will see the little yellow flowers in the middle of the bracts of leaves which are what we think are the flowers. Crystals are even the right shape for them. I remember seeing these plants growing as large trees in Spain and have always loved them. Having a poinsettia in my home at Christmas brightens up the room although I must confess I am better at digitising them than keeping them from leaf drop! 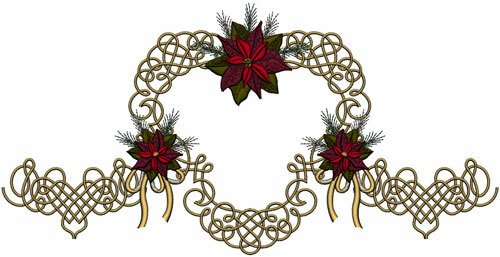 Another alternative is to use the 3 dimensional poinsettias in the Stars over Bethlehem collection. 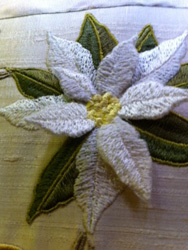 Add these to the designs in Poinsettia Promises collection. 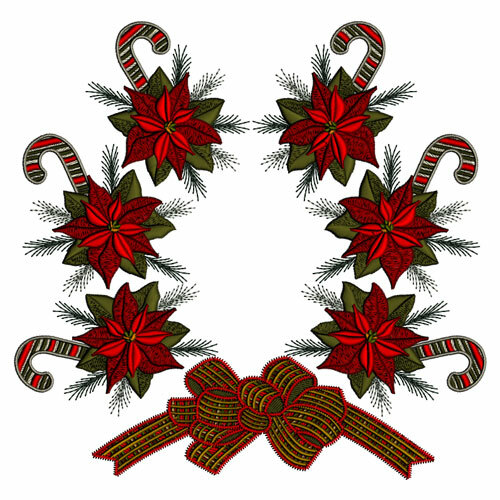 As well as being great embroidery for wall hangings, Christmas quilts and table linen you may want to consider using the designs for a tree skirt. I have placed the scroll work on this design in a heart shape and can see this gracing the edge of a skirt with GFE-PTP-2-1 above it. It’s never too early to think about next Christmas! I am already thinking about my collection for Christmas 2015. 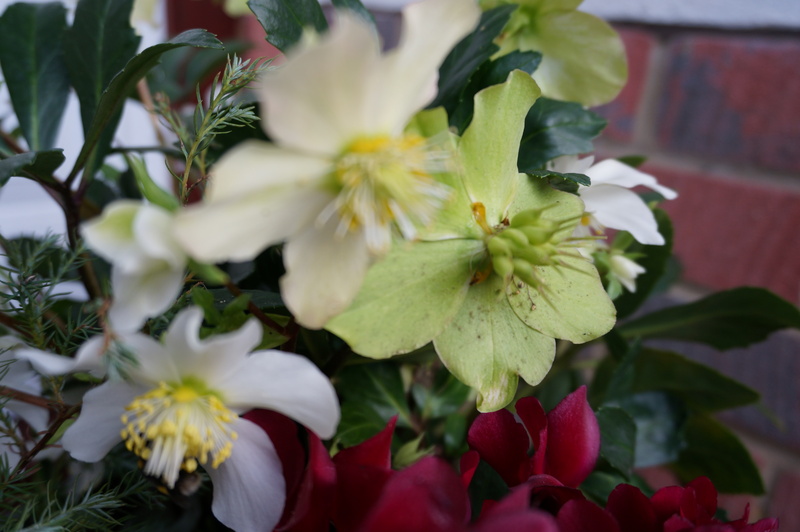 As well as loving Poinsettias I adore hellebores and they featured in my first Christmas collection, Celtic Christmas. I hope to create a unique collection of dimensional hellebores, or Christmas roses as they known. I have several plants growing in my garden to inspire me. 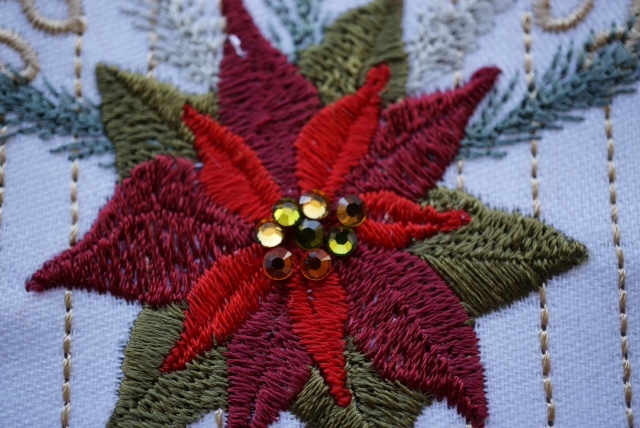 This entry was posted in Discussing machine embroidery and tagged Christmas, Crystals, Embellishment, machine embroidery. Bookmark the permalink. They’re all so beautiful, Hazel. I think this is my favorite out of all the designs you have. Just like other designs, this is also outstanding and excellent. Keep sharing such beautiful designs.